The iconostasis, or “icon screen”, at St. Symeon’s was the work of Ilias and George Laskos of Koufalia, Greece. It was completed in December 2014, and took about nine months to make. All of the carving on the iconostasis was done by hand. The carvings are in the “Byzantine” style, so-named because it proliferated during the thousand-year history of Byzantium from the 4th to the 15th century. Our iconostasis includes several traditional Byzantine motifs, but also includes other carvings for the edification and instruction of the worshippers. At the center of the iconostasis are the “Royal Doors”, upon which are icons of the Archangel Gabriel and the Virgin Mary depicting the Annunciation or “good news”, when the Virgin acknowledged and accepted the announcement that she would bear a son Emmanuel, which means, “God with us”. Below this scene are the four evangelists, who wrote the Gospels-- the story of the Good News, which is the life and teaching of Jesus. A “Byzantine” cross tops the Royal Doors. Often called the “Russian cross” because it is so popular in that country, the Byzantine cross includes the upper bar where the inscription “King of the Jews” was ordered to be written by Pilate. The lower bar, where Jesus’ feet were nailed, slants up to His right since the Good Thief confessed Him and it points down to the left since the thief crucified on His left mocked Him. Above the Royal Doors is the icon of the Mystical Supper, since through these doors the King of Kings is brought out in the form of Holy Communion to the faithful. On either side of this icon are depictions of the Seraphim, the six-winged angels that fly around the Throne of God in heaven chanting the Thrice-Holy Hymn, “Holy, holy, holy, Lord God of Sabbaoth, heaven and earth are full of Thy glory!” (Isaiah 6:3; Revelation 4:8). The prototype of these Seraphim is from mosaics in the central dome of Hagia Sophia, originally constructed in 6th century Constantinople, now known as Istanbul, Turkey. To the right of the Royal Doors is the icon of Christ, identified by the Greek letters “ΙC ΧΡ”, which is the abbreviation for “Jesus Christ”. 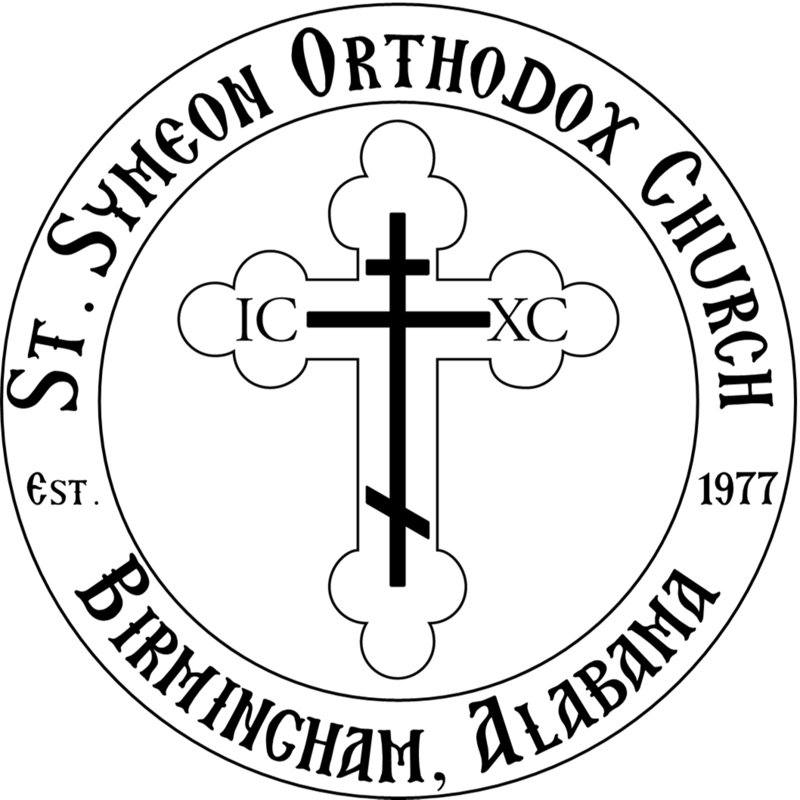 The Greek letters “ό ών”, found inside the halo of this icon (and on all Orthodox icons of Christ), identify Him as the great “I Am” of the Old Testament, confirming the Orthodox teaching that He is “God before the ages” (Exodus 3:14; John 1:1). This icon, and all icons on the lower level of the iconostasis, was painted in 1988 by the world-class Byzantine iconographer Elias Katsaros of Huntsville, Alabama. Below the icon of Christ is the carved “Chrismon”, an ancient symbol for Christ composed of the Greek letters “XP” imposed on a cross with the Greek letters underneath, “A Ω”, alpha and omega, referring to Christ as the “beginning and the end” of all existence, (Revelation 22:13). To the left of the Royal Doors, is the icon of the Virgin Mary. She is identified by the Greek letters, “MP ΘY”, which stands for “Mother of God”. Below her icon is a carving representing the Ark of the Covenant guarded by the Cherubim (Exodus 25:20). Mary was the living ark and “Mercy Seat” since she contained God the Word within her womb (Hebrews 9: 1-7). To the right of Christ is the icon of St. John the Baptist, about whom Christ said there was, “no greater man born” (Matt 11:11). Below the icon of St. John is a carving of an axe wedged into a tree. This ancient symbol refers to the call to repentance by St. John, “And now also the axe is laid unto the root of the trees: therefore every tree which bringeth not forth good fruit is hewn down, and cast into the fire” (Matt 3:10). The next icon to the right depicts St. Stephen the First Martyr, who is vested as a deacon, swinging a censer, and holding a small tabernacle which represents the ministry of deacons to the Church. Under his icon is a carving of a laurel wreath crown, the symbol of his heavenly reward as a martyr (Acts 6:5 – 8:2). This panel of the iconostasis is also a door, called the “deacon’s door”, since through it the deacon and other servers enter the holy altar. On the far right is St. Herman of Alaska, America’s first Orthodox saint. St. Herman was an 18th century missionary from Russia who spent his life teaching and ministering to the natives of Alaska. The carved cross below his icon is a Russian cross, similar to a large iron one that St. Herman wore during his life, which is now preserved in his chapel on Kodiak Island, Alaska. The icon on the far left of the iconostasis depicts St. Nicholas who was a 4th century bishop. St. Nicholas participated in the First Great Council of the Church in Nicea in 325, although he is usually remembered for saving four young girls from being sold into slavery. This act of charity has helped promote him as the first “Santa Claus”, loved by children of all ages. St. Nicholas is also the patron of sailors and travelers so his carved symbol here is a ship. Second from the left is the icon of the Archangel Michael, leader of the angels (Daniel 10:13; Jude 1:9; 1 Thess 4:16; Rev 12:7). The archangel’s icon is often found on one of the deacon’s doors since the angels mystically participate in Orthodox worship on earth as they participate in the continuous worship in heaven. The carved symbols for the Archangel Michael are the Greek letters “A X K” which stand for “Archangel of the Lord”. The icon next to the Mother of God is St. Symeon the New Theologian, the patron saint of our parish. St. Symeon was a priest-monk in 11th century Constantinople, who taught that men could know God through a life of self-denial and prayer. His writings are so profound that St. Symeon is one of only three men called “theologian” in the Orthodox Church. The two-headed eagle under his icon is the symbol of Constantinople and the Byzantine Empire, which stretched across two continents until it was conquered by the Muslims in the 15th century. Georgian Cross of St. Nina- Born in 296, St. Nina was the first Christian Queen of Georgia. She was given a cross made of grapevines by the Virgin Mary as a help in her missionary work in Georgia. Canterbury Cross- This cross style dates from around 850 when England was in full communion with the Orthodox churches of the East. Canterbury has been a center of English Christianity since 597 when St. Augustine of Canterbury became its first archbishop. Russian Soldier Cross- So called since it was given by the Tsar to his soldiers, this cross has the Byzantine or Russian three-bar cross in the center. This cross reminds us to “fight the good fight of faith” of “righteousness, godliness, faith, love, patience and meekness” (1 Timothy 6). St. Andrew Cross- The “First-Called” Apostle Andrew, the brother of St. Peter, preached Christ as far as Romania, Kiev and Novgorod and was martyred in Patras, Greece. Since he deemed himself unworthy to die on the same type cross as his Savior, he was crucified on an “X” shaped cross. St. Andrew became the patron of Scotland in the 9th century and the “X” cross can now be seen in the flags of Scotland, Great Britain and even Alabama. St. Catherine Cross- St. Catherine, the daughter of the Roman governor of Alexandria, Egypt, was a virgin-martyr who gave her life for Christ in the year 305, when she refused to worship the Roman emperor. This style cross is found in a 6th century fresco at the St. Catherine Monastery at the foot of Mount Sinai in Egypt, where her sacred relics can be found today. Ephesus Cross- While examples of this style cross can be found around the Mediterranean, it is frequently seen on ancient stone carvings in the ruins of Ephesus, now in modern-day Turkey. Ephesus, one of the seven churches mentioned in the book of Revelation, and to whom St. Paul wrote one of his epistles, was also the site of a Great Council in 431, where Mary was proclaimed “Theotokos” which means “Birth-Giver of God”. NIKA Cross- The Greek letters at the top of this cross are “IC XC” which are the first and last letters of “Jesus Christ” in Greek. “NIKA” is Greek for “conquers” or “is victorious” (also used by “NIKE” sports apparel). St. Constantine the Great had a vision of the cross in the sky as he was going into battle in York (modern day England) in 306. This led to his conversion to Christianity and to him eventually calling the First Council of Nicea in 325, where the Nicene Creed was written. Celtic Cross- This unique cross is thought to have been used by St. Patrick in the 5th century when he was preaching Christianity to sun-worshippers in Ireland. Ancient examples of the Celtic cross can also be found in Scotland and in western France. St. Patrick became the first bishop of Ireland. St. George Cross- The simple design of this cross is taken from an ancient cave church in Ethiopia dedicated to St. George. The Great-Martyr George, born in Lydda, Palestine, was a soldier in the Roman army who was martyred for Christ in 303. St. George is the patron saint of England and this cross design can be seen on the national flags of England, Georgia, Greece, Sweden, and Finland. Troitsa Cross- The Troitsa or “Trinity” cross is found in the courtyard of almost every Romanian Orthodox church and monastery. This cross gets its name from the fact that it is usually three crosses together, traditionally carved from one large log. In addition to affirming the worship of the Holy Trinity, the three crosses, like the slanting bottom bar on the Russian cross, remind us of the witness of the two thieves crucified on either side of Christ. The grape-vine carving across the iconostasis is an ancient symbol for Christ and His Church, since He said, “I am the vine, you are the branches. He who abides in Me, and I in him, bears much fruit; for without Me you can do nothing” (John 15:5). The grapes are symbols of the fruit of the Holy Spirit, “…the fruit of the Spirit is love, joy, peace, longsuffering, kindness, goodness, faithfulness, gentleness, self-control” (Galatians 5:22). The peacock is an ancient Christian symbol, very popular in Byzantine culture that symbolizes immortality. The peacock also represents the transforming and transfiguring grace of God, while the hidden beauty of the peacock symbolizes the virtue of humility. The peacock drinking from a fountain or chalice symbolizes the Christian partaking of grace through Holy Baptism and Holy Communion. The shrine on the left contains an icon modeled after the “Vladimir” icon of the Theotokos. The original Vladimir icon was painted by the Apostle Luke and found its way to the ancient town of Vladimir, Russia, thus its name. This style icon of the Virgin and Christ-child is known as “tenderly merciful” (“Eleousa” in Greek; “Umeleniye” in Russian). The original Vladimir icon now resides in a chapel added to the Tretyakov Art Gallery in Moscow. The Greek letters “MP ΘY” in the carving below the icon stand for “Mother of God”. The shrine on the right is dedicated to St. Luke of Crimea. St. Luke, born in 1877, was a renowned surgeon in Russia during the Soviet era. After the death of his wife, he became a monk and eventually became archbishop of Simferopol, Crimea, while still practicing surgery and publishing medical and spiritual writings. For his unwavering faith, he spent years in exile and in Soviet prisons, often enduring torture. St. Luke died in 1961 and was canonized as a saint in 1996. His heavenly intercession for physical and spiritual healing is proclaimed by Orthodox Christians around the world. The relic encased in the smaller icon is a piece of his vestments, a gift to our parish from the Transfiguration Monastery in Sagmata, Greece, which houses a very large collection of his relics and personal belongings.